This has been one of those "I want to read you, but you will remain on my shelf and somewhere on my TBR" books. Until a few weeks ago, when I found the audiobook at the library and decided to take the plunge. (Full confession: I wasn't loving the audiobook I was currently listening to, so it was an easy distraction!) I am happy to report that I simply adore this book! Adore. I'm super happy because I didn't love Leah on the Offbeat, but this gave me all the happy feels of Simon vs. the Homo Sapiens Agenda. What I loved most about it was this: it was 100% real. Molly is 100% real. In this day and age, so many YA books include these kickass protagonists who know exactly what they want in life and what they should do, and then they have no problem doing it. It's empowering and I absolutely love it. ...but was I like that at 17 years old? No. I was more like Molly. Molly who lives so much in her head. Molly who questions so many things. Not that Molly didn't know who she was, because she did. She had a great sense of self and was strong and loyal in her beliefs. But she also had the realistic hopes and fears of a teenager. And what I loved about her was this: Molly Peskin-Suso is quietly brave. She doesn't dismantle a dystopian society, no, but she steps outside of her comfort zone and she takes chances. I adore this girl. Random funny note: the audiobook narrator was fantastic, but it was just funny hearing how she read Abby, because her Abby was nothing like Alexandra Shipp (who was Abby in the Love, Simon movie and is so now how I picture her.) But I also loved how the characters from Simon appeared a few times in this book. So fun! This is the type of book you want to pick up and hug, because it's so adorable and so lovely. 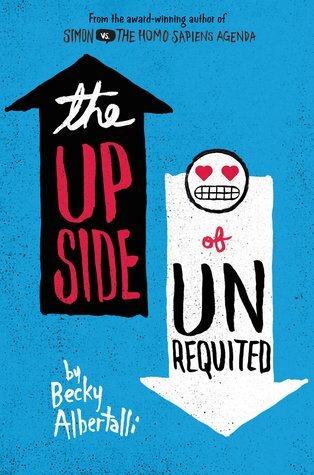 If you haven't had the chance to try Unrequited yet, I definitely recommend you do so!